We have heard of pens being phones before, but the idea of pulling a phone’s flexible display from a pen seems new, or is it? Let’s have a look at this Sony PlayStation concept phone and remember it. Anyway, today we have a new step in design evolution, the Samsung ONE, created by Yejin Jeon. 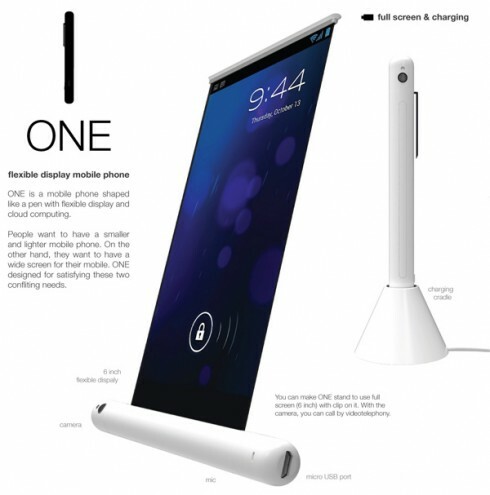 This handset is basically a flexible display mobile phone hidden inside an elegant, white pen. 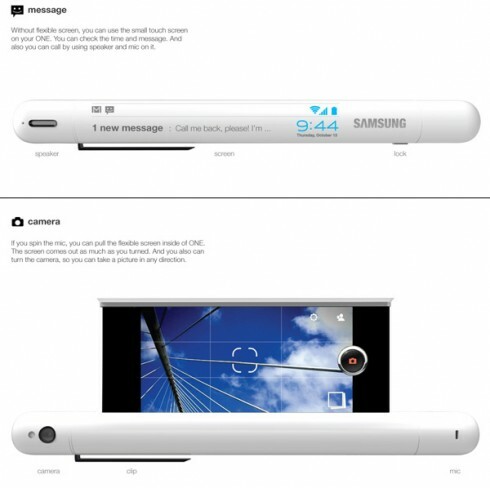 The Samsung concept relies on cloud computing and involves a wide screen display that comes out of the pen. This screen is a 6 inch bendable sheet and at the edge of the pen we also have an embedded camera. You can make ONE stand in order to use the 6 inches of screen estate to their full extent. When the display is inside the pen there’s a small touchscreen on the side of the pen, as shown in the image below. This one allows you to control the device and has the role of showing notifications, signal, battery and more. There’s a speaker at the edge of the device and a lock at the other. The brilliant thing about this device is that you can pull part of the flexible screen of the ONE and use it as a camera viewfinder when you turn the handset’s camera on, that’s very, very cool. I say that such a product is doable with today’s technology, but it could end up being much thicker. This design is part of the iF Design Talents competition and I already give it a big thumbs up.